The cluster of differentiation is a protocol used for the identification and investigation of cell surface molecules providing targets for immunophenotyping of cells. In terms of physiology, CD molecules can act in numerous ways, often acting as receptors or ligands important to the cell. A signal cascade is usually initiated, altering the behavior of the cell. Some CD proteins do not play a role in cell signaling, but have other functions, such as cell adhesion. CD for humans is numbered up to 371. The Fas receptor is a death receptor on the surface of cells that leads to programmed cell death (apoptosis). It is one of two apoptosis pathways, the other being the mitochondrial pathway. FasR is located on chromosome 10 in humans and 19 in mice. Similar sequences related by evolution (orthologs)  are found in most mammals. Chromosome 10 is one of the 23 pairs of chromosomes in humans. People normally have two copies of this chromosome. Chromosome 10 spans about 133 million base pairs and represents between 4 and 4.5 percent of the total DNA in cells. A transmembrane protein (TP) is a type of integral membrane protein that spans the entirety of the cell membrane to which it is permanently attached. Many transmembrane proteins function as gateways to permit the transport of specific substances across the membrane. They frequently undergo significant conformational changes to move a substance through the membrane. TIA1 is a 3'UTR mRNA binding protein that can bind the 5'TOP sequence of 5'TOP mRNAs. It is associated with programmed cell death (apoptosis) and regulates alternative splicing of the gene encoding the Fas receptor, an apoptosis-promoting protein. Under stress conditions, TIA1 localizes to cellular RNA-protein conglomerations called stress granules. Fas forms the death-inducing signaling complex (DISC) upon ligand binding. Membrane-anchored Fas ligand trimer on the surface of an adjacent cell causes oligomerization of Fas. Recent studies which suggested the trimerization of Fas could not be validated. Other models suggested the oligomerization up to 5-7 Fas molecules in the DISC. This event is also mimicked by binding of an agonistic Fas antibody, though some evidence suggests that the apoptotic signal induced by the antibody is unreliable in the study of Fas signaling. To this end, several clever ways of trimerizing the antibody for in vitro research have been employed. The death-inducing signaling complex or DISC is a multi-protein complex formed by members of the "death receptor" family of apoptosis-inducing cellular receptors. A typical example is FasR, which forms the DISC upon trimerization as a result of its ligand (FasL) binding. The DISC is composed of the death receptor, FADD, and caspase 8. It transduces a downstream signal cascade resulting in apoptosis. Fas ligand is a type-II transmembrane protein that belongs to the tumor necrosis factor (TNF) family. Its binding with its receptor induces apoptosis. Fas ligand/receptor interactions play an important role in the regulation of the immune system and the progression of cancer. Signal transducing adaptor proteins (STAPs) are proteins that are accessory to main proteins in a signal transduction pathway. Adaptor proteins contain a variety of protein-binding modules that link protein-binding partners together and facilitate the creation of larger signaling complexes. These proteins tend to lack any intrinsic enzymatic activity themselves, instead mediating specific protein–protein interactions that drive the formation of protein complexes. Examples of adaptor proteins include MYD88, Grb2 and SHC1. 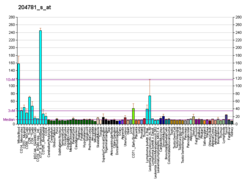 Fas-associated protein with death domain (FADD), also called MORT1, is encoded by the FADD gene on the 11q13.3 region of chromosome 11 in humans. FADD also contains a death effector domain (DED) near its amino terminus,  which facilitates binding to the DED of FADD-like interleukin-1 beta-converting enzyme (FLICE), more commonly referred to as caspase-8. FLICE can then self-activate through proteolytic cleavage into p10 and p18 subunits, two each of which form the active heterotetramer enzyme. Active caspase-8 is then released from the DISC into the cytosol, where it cleaves other effector caspases, eventually leading to DNA degradation, membrane blebbing, and other hallmarks of apoptosis. 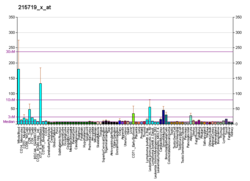 Although Fas has been shown to promote tumor growth in the above mouse models, analysis of the human cancer genomics database revealed that FAS is not significantly focally amplified across a dataset of 3131 tumors (FAS is not an oncogene), but is significantly focally deleted across the entire dataset of these 3131 tumors,  suggesting that FAS functions as a tumor suppressor in humans. Some reports have suggested that the extrinsic Fas pathway is sufficient to induce complete apoptosis in certain cell types through DISC assembly and subsequent caspase-8 activation. These cells are dubbed Type 1 cells and are characterized by the inability of anti-apoptotic members of the Bcl-2 family (namely Bcl-2 and Bcl-xL) to protect from Fas-mediated apoptosis. 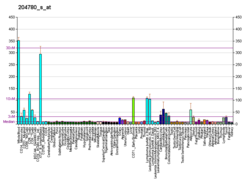 Characterized Type 1 cells include H9, CH1, SKW6.4 and SW480, all of which are lymphocyte lineages except the latter, which is a colon adenocarcinoma lineage. However, evidence for crosstalk between the extrinsic and intrinsic pathways exists in the Fas signal cascade. Caspases are a family of protease enzymes playing essential roles in programmed cell death and inflammation. They are named caspases due to their specific cysteine protease activity – a cysteine in its active site nucleophilically attacks and cleaves a target protein only after an aspartic acid residue. As of 2009, there are 11 or 12 confirmed caspases in humans and 10 in mice, carrying out a variety of cellular functions. In the field of cell biology, TNF-related apoptosis-inducing ligand (TRAIL), is a protein functioning as a ligand that induces the process of cell death called apoptosis. Follicular atresia is the breakdown of the ovarian follicles, which consist of an oocyte surrounded by granulosa cells and internal and external theca cells. It occurs continually throughout a woman's life, as she is born with millions of follicles but will only ovulate around 400 times in her lifetime. Typically around 20 follicles mature each month but only a single follicle is ovulated; the follicle from which the oocyte was released becomes the corpus luteum. The rest undergo follicular atresia. The BH3 interacting-domain death agonist, or BID, gene is a pro-apoptotic member of the Bcl-2 protein family. Bcl-2 family members share one or more of the four characteristic domains of homology entitled the Bcl-2 homology (BH) domains, and can form hetero- or homodimers. Bcl-2 proteins act as anti- or pro-apoptotic regulators that are involved in a wide variety of cellular activities. The Bcl-2-associated death promoter (BAD) protein is a pro-apoptotic member of the Bcl-2 gene family which is involved in initiating apoptosis. BAD is a member of the BH3-only family, a subfamily of the Bcl-2 family. It does not contain a C-terminal transmembrane domain for outer mitochondrial membrane and nuclear envelope targeting, unlike most other members of the Bcl-2 family. After activation, it is able to form a heterodimer with anti-apoptotic proteins and prevent them from stopping apoptosis. Caspase-8 is a caspase protein, encoded by the CASP8 gene. It most likely acts upon caspase-3. CASP8 orthologs have been identified in numerous mammals for which complete genome data are available. These unique orthologs are also present in birds. Tumor necrosis factor receptor type 1-associated DEATH domain protein is a protein that in humans is encoded by the TRADD gene. Caspase-10 is an enzyme that, in humans, is encoded by the CASP10 gene. Death receptor 5 (DR5), also known as TRAIL receptor 2 (TRAILR2) and tumor necrosis factor receptor superfamily member 10B (TNFRSF10B), is a cell surface receptor of the TNF-receptor superfamily that binds TRAIL and mediates apoptosis. Diablo homolog (DIABLO) is a mitochondrial protein that in humans is encoded by the DIABLO gene on chromosome 12. DIABLO is also referred to as second mitochondria-derived activator of caspases or SMAC. This protein binds inhibitor of apoptosis proteins (IAPs), thus freeing caspases to activate apoptosis. Due to its proapoptotic function, SMAC is implicated in a broad spectrum of tumors, and small molecule SMAC mimetics have been developed to enhance current cancer treatments. Receptor-interacting serine/threonine-protein kinase 1 (RIPK1) is an enzyme that in humans is encoded by the RIPK1 gene, which is located on chromosome 6. 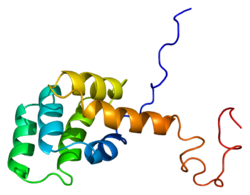 This protein belongs to the Receptor Interacting Protein (RIP) kinases family, which consists of 7 members, RIPK1 being the first member of the family. 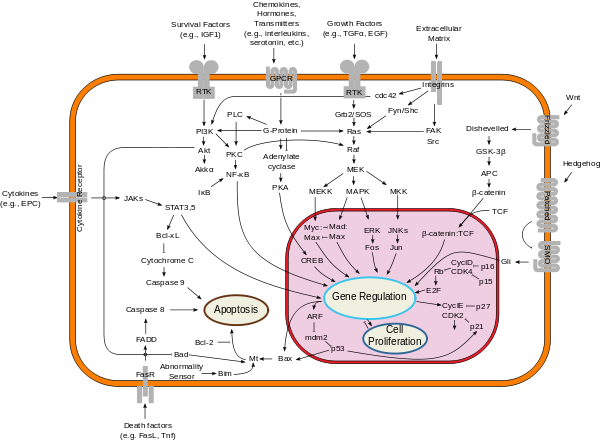 Apoptosis regulatory protein Siva is a protein that in humans is encoded by the SIVA1 gene. This gene encodes a protein with an important role in the apoptotic pathway induced by the CD27 antigen, a member of the tumor necrosis factor receptor (TFNR) superfamily. The CD27 antigen cytoplasmic tail binds to the N-terminus of this protein. Two alternatively spliced transcript variants encoding distinct proteins have been described. The death domain (DD) is a protein interaction module composed of a bundle of six alpha-helices. DD is a subclass of protein motif known as the death fold and is related in sequence and structure to the death effector domain (DED) and the caspase recruitment domain (CARD), which work in similar pathways and show similar interaction properties. DD bind each other forming oligomers. Mammals have numerous and diverse DD-containing proteins. Within these proteins, the DD domains can be found in combination with other domains, including: CARDs, DEDs, ankyrin repeats, caspase-like folds, kinase domains, leucine zippers, leucine-rich repeats (LRR), TIR domains, and ZU5 domains. AICD is programmed cell death caused by the interaction of Fas receptors and Fas ligands. AICD is a negative regulator of activated T lymphocytes that results from repeated stimulation of their T-cell receptors (TCR) and helps to maintain peripheral immune tolerance. Alteration of the process may lead to autoimmune diseases. ↑ Nagata S (July 2004). "Early work on the function of CD95, an interview with Shige Nagata". Cell Death and Differentiation. 11 Suppl 1 (Suppl 1): S23–7. doi:10.1038/sj.cdd.4401453. PMID 15143352. ↑ Wang; et al. (2010). "The Fas–FADD death domain complex structure reveals the basis of DISC assembly and disease mutations". Nat Struct Mol Biol. 17 (11): 1324–29. doi:10.1038/nsmb.1920. PMC 2988912 . PMID 20935634. ↑ Liu F, Bardhan K, Yang D, Thangaraju M, Ganapathy V, Liles G, Lee J, Liu K (June 2012). "NF-κB directly regulates Fas transcription to modulate Fas-mediated apoptosis and tumor suppression". J Biol Chem. 287 (30): 25530–40. doi:10.1074/jbc.M112.356279. PMC 3408167 . PMID 22669972. ↑ Yang D, Torres CM, Bardhan K, Zimmerman M, McGaha TL, Liu K (May 2012). "Decitabine and vorinostat cooperate to sensitize colon carcinoma cells to Fas ligand-induced apoptosis in vitro and tumor suppression in vivo". J. Immunol. 188 (9): 4441–9. doi:10.4049/jimmunol.1103035. PMC 3398838 . PMID 22461695. Cascino I, Papoff G, Eramo A, Ruberti G (2004). "Soluble Fas/Apo-1 splicing variants and apoptosis". Front. Biosci. 1 (4): d12–8. doi:10.2741/A112. PMID 9159204.